The Kiwi is the national bird of New Zealand. It is flightless, its feathers appear as hairs. Little Spotted Kiwi/kiwi pukupuku (Apteryx owenii) on several offshore islands and two mainland sanctuaries. Great Spotted Kiwi/roroa (A. haastii) in the northwestern South Island and around Arthur's Pass. Brown Kiwi (A. mantelli) in the North Island. Rowi (A. rowi) at Okarito, on the West Coast of the South Island. Tokoeka (A. australis) in the South Island (Fiordland, the Haast Range and Stewart Island). 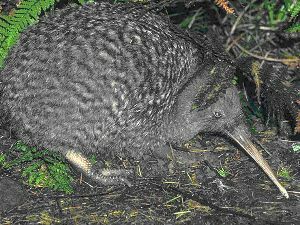 Arthur's Pass National Park is home to the Great Spotted Kiwi. Both the Great & Little Spotted Kiwis are only found in the South Island. Kiwis are mainly nocturnal, however can still function during the day if the need arises. It is not un-usual to see Kiwi on Stewart Island foraging for food mid-afternoon. Kiwi eat berries, insect lavae and worms, using their long beaks to hunt down both the later. They nest in natural or excavated holes under stones, in stream banks, between tree roots or even on open, flat ground. The female lays 1 or 2 highly-glazed, ivory white or greenish eggs which are extremely large and may weigh up to one quarter of the adult birds weight. Eggs are incubated by the male.